It is easy to see why the long, tapered pods of okra have the name lady's fingers, although they are also known as bamia, bhindi and gumbo. Okra is widely used to add texture to soups and stews in India, the Middle East, Africa, the Caribbean and Louisiana. 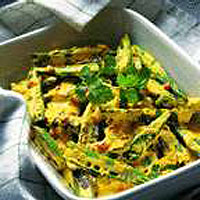 It makes a very good accompaniment to curries and other spicy dishes and combines particularly well with tomatoes. Top and tail 2 x 125g packs okra and slice them lengthways. Fry for 5 minutes in 2tbsp oil. Add 2tsp chopped fresh ginger, 1 deseeded and chopped red chilli, 1tsp turmeric, and salt to taste. Stir well and add a little water. Cook, covered, until the okra is tender. Stir in 2 x 150g tubs Waitrose Greek-style yogurt and 1tbsp chopped fresh coriander. Stir well and serve.